Into the last eight: Yorkshire's Kyle Edmund. 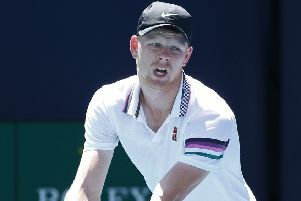 YORKSHIRE’S Kyle Edmund fought off weariness and Andreas Seppi to reach his first grand slam quarter-final at the Australian Open. “It’s a good feeling,” said Edmund, who is fast becoming one of the most exciting young talents in the game. The rankings made the 23-year-old the favourite - 49 to Seppi’s 76 - while he had won their only previous meeting. But Seppi is a former top-20 player and a man of some pedigree in Melbourne having reached the last 16 on three previous occasions and beaten Roger Federer and Nick Kyrgios twice. It was to prove the turning point. Seppi’s second serve was no match for the Edmund forehand when the 23-year-old unleashed his big weapon at 5-6 and he took his second set point as the Italian’s forehand hit the top of the net and dropped wide.